Because we were having company for dinner, I also wanted to have a dessert. Nothing too fancy because I'd just cleaned the kitchen and didn't want to spread flour everywhere making a pie crust. So, I came up with something on a whim with what we had in the kitchen and was pleasantly surprised! 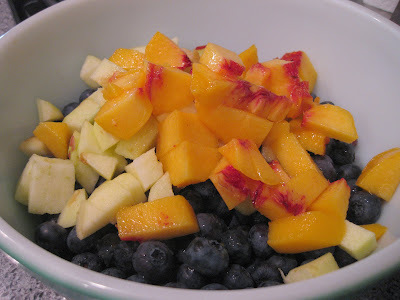 Mix the fruit, sugar, and flour in a medium bowl until the fruit is covered with the mixture. Turn out into a sprayed baking dish. In the same bowl (no need to dirty excess dishes, right?) mix the oats, brown sugar, and melted butter until everything is incorporated. The consistancy will be like damp sand. Sprinkle over the top of the fruit, making sure the evenly distribute and also get some near the edge and corners. Pop the covered dish into a 350° oven for 30 minutes. Remove the foil and bake an additional 15 minutes. Finish the dish a minute or two under the broiler. We had Johnny's coworker Goran over for "Dinner at Christina's," so I wanted to make him an authentic Italian meal. I made a big pot of sauce, but this time I got to use some fresh herbs from Johnny's mom's garden, instead of all dried options. 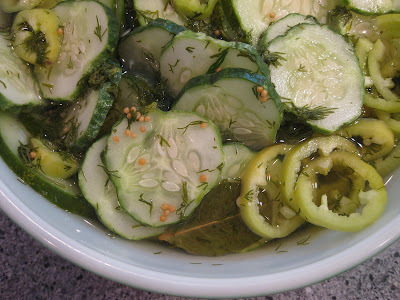 Next, I sliced one zucchini from Johnny's mom's garden and layed the pieces out on a plate and salted them. I thawed a 2 lb. package of chicken breasts from the freezer and pounded them out to about 1/4" thick in between plastic wrap. They were the big, thick breasts, so when I started pounding the chicken tender from underneath sort of became it's own separate part. We ended up with 3 small chicken pieces and 3 very large chicken pieces. I brought about 1/2" of vegetable oil up to temperature in a high sided skillet to fry the zucchini and chicken in. Wet the zucchini with the egg mixture first, and then dredge in the flour, knocking off any excess. Then, everybody into the oil until they're lightly browned and crispy on either side. After they were done, I moved them to a paper towel to drain and then into a casserole dish with some sauce on top and a mixture of mozzarella and Parmesan cheese sprinkled over. Dredge the chicken in the flour, knocking off any excess and then into the egg bath. Last, into the bread crumbs and then in the oil. Cook for a few minutes on each side until the breading is browned and crispy. Move to a paper towel to drain, then lay on a foil-covered baking pan and top with the sauce and mozarella and Parmesan cheese mixture. Both dishes went into a 350° oven for about 10 minutes or so, and then under the broiler for a minute or two. You can serve with extra sauce or spaghetti, but we just ate as it was and it was delicious (if I don't say so myself)! Crossing things off my Freezer Meat Challenge list I realized that I hit all the safe and easy things first. I have been avoiding the larger items like racks of ribs and whole chickens because they just seem intimidating to me. Throwing caution to the wind, I thawed the pork spare ribs, drawing inspiration from this month's copy of Taste of Home magazine. Slow cooker ribs are on the cover and I've cooked them before successfully, and gosh dang it I could do it again! I won't even bother posting their recipe because the only things I did similiar was use barbecue sauce and something fruity, that was all the boost I needed to get me started down the creative path of dinner prep. First, I sprayed the crock pot (this is very helpful in the cleaning process). Then I dumped in the onion, garlic and black pepper. I found the barbecue sauce in the fridge and dumped it in after tasting a small bit on my finger to see if I liked it. By the time I'd dumped it in, the heat on my tongue had started to grow and have a little burn to it. That's when I noticed it was the Hot n Spicy sauce. Eeep! How to tone it down? I didn't want to use cherry preserves like the magazine recipe, so I grabbed the beautiful POM bottles! I dumped the first one in, tasted, and it was much improved. The 2nd bottle I dumped in the barbecue bottle and shook to rinse it out and get all the flavor out. I whisked everything together and the taste was fantastic! Still a nice kick from the barbecue sauce, and a delicious fresh, tart burst from the POM. Last, I trimmed the pork ribs of excess fat and cut them into individual rib sections and threw them in the sauce. Cook on low for 6-8 hours, until meat is tender. I cooked mine on low for about 6 hours and they were juicy and tender. Unfortunately, I turned it on high for an hour with the lid off to try and thicken up the sauce, that had become pretty watery, and the meat dried out a little bit. I'd recommend just sticking to the low and slow method, ignoring the sauce because it still coats all the ribs and gives them DELICIOUS flavor. Johnny and I almost finished a whole ~2 lb. rack ourselves, despite them being a little dried out. The sauce was really tasty and I would have never thought to add something fruity to hide in the background, but now I think it'll become a habit of mine! Cooking in the crockpot kept them juicy and eliminates the fear of the sugars in the BBQ sauce and POM from catching fire on the grill and charring too much. This summer the fruits and vegetables have been so great around here! The blueberries are huge, juicy and plump, the watermelon full of flavor and not living up to their name of water. Bleck! And don't even get me started on the corn... this is some of the best corn on the cob I've eaten in my life! Perhaps because of their quality, and all of the produce we're receiving from Johnny's mom's garden, I keep finding myself in a frenzy of needing to use it up before it goes to waste! The fridge had half of a head of cauliflower, a big zucchini, and two ears of corn that were just itching to be cooked. I immediately thought to grill it all because our weather has also been beautiful. To accompany the grilled veggies, I picked another grill-friendly food - Brats from the freezer! Which called for onions and peppers! I chunked up all the vegetables (cauliflower, zucchini, onions, and peppers) and marinated them in Newman's Own Caesar dressing. The corn I just soaked in water before throwing it on the grill. A quick 30 minutes for the brats, and about 10-15 minutes for the veggies and dinner was served. Added bonus of no dishes to clean, just a grill grate to wipe down! Stop by Hey What's for Dinner Mom? each Sunday for the BFF (Best Foodie Foto) contest. Check out the entries - blogger's best photos from the previous week, and leave your vote for the best in the comment section! Anybody an Original Pancake House fan? There's one a few blocks from our house and on the rare occasion we dine out for breakfast, we brave the crowds and go there. Johnny gets something sweet, like the blueberry crepes, which is not my cup of tea. I'm much more of a savory breakfast person. I usually order a skillet that I can't find on their online menu. 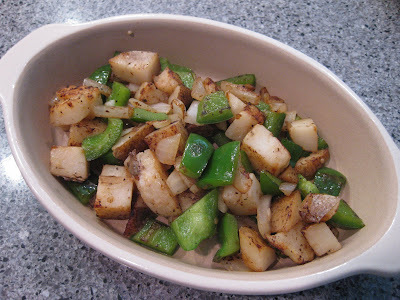 It comes in a little bakeware dish and has their potatoes at the bottom, sauteed with peppers and onions. There's different meat choices and I usually get the one that has chunks of ham. Last, your choice of two eggs on top, and I think depending on what option you chose, cheese. I decided to try and re-create something similiar at home. I was excited to use a new Pampered Chef oval stoneware dish I'd gotten brand new, still in the box for $3.99. It's not for sale on their site anymore, but similiar ones look to be about $28. I love thrift stores! To start, I sauteed a chunked up baked potato (from Johnny's mom's garden!) in a pan with a spray of Pam and onions (from Johnny's mom's garden!) and green peppers. Once done, they went into the stoneware. Next, I scrambled two eggs (from Johnny's mom's chickens!) with a little salt and pepper. These went over the potato mixture. Last was some shredded cheese mixture over the eggs. And into the toaster oven to brown up under the broiler for a few minutes. The result was a delicious, hearty breakfast that reminded me how important it is to start the day off with a substantial meal! Flipping through The Perfect Scoop I was intrigued by so many of the recipes. Guinness-Milk Chocolate Ice Cream? You can put beer in ice cream?! Who knew? There's Goat Cheese Ice Cream! Basil Ice Cream!! My eyes were popping out of my head with each page turn. I kept going back to page 62, though. Cheesecake Ice Cream. It sounded too good to be true. I love cheesecake and I could tell by the ingredients this would be my kind of cheesecake with both cream cheese and sour cream and *gulp* half-and-half. Then I figured why the heck not?! Now that that was settled, we could get onto more important things! Then, process in your ice cream maker per manufacturer's instructions. At first I was hesitant at the lemon zest addition. Lemon cheesecake? I just want plain cheesecake! Hearty, cheesy, creamy goodness. A little dab'll do ya! It's very heavy, so we were enjoying it a tiny, tiny bowlful at a time. Until Johnny came up with an ingenius idea. Sandwich the cheesecake ice cream in between graham crackers for a truly authentic cheesecake (with crust!) experience. Just another reason I love him! Back then, when we first started "talking," I was scooping ice cream nights at my dad's friend's store. Johnny immediately showed great excitement, saying ice cream was his favorite food! Fast forward to now, with his whey allergy and the economy tanking. Remember I said whey is mainly used in processed foods to bulk them up? It's popping up in previously "safe" favorites of his, many ice cream flavors included. I'm talking FIRST. INGREDIENT. in the list is whey. Not a pretty picture. So, for his birthday, I got Johnny a Cuisinart ice cream maker, thinking I could make him his old favorites, minus the whey. What happened next I did not anticipate. My former tech geek, lover of all computer gadgets and gizmos fell in love with the idea and promptly ordered himself an ice cream book in excitement of all the possibilities and a second freezer bowl so there's no delay in making batches. I've created an Alton Brown. Don't believe me?! He bought a digital thermometer for the freezer to monitor that it's at 0° for the bowl inserts to freeze. I rest my case. The first recipe he chose, and the reason for ordering Perfect Scoop, was roasted banana ice cream. Bananas. Roasted. For 40 minutes. I cannot put into words what this picture smells like. You just need to experience it firsthand. Descriptive words haven't been invented for the smells and euphoria this evokes. Trust me. Toss everything to coat and put into a 400° oven for 40 minutes, turning once. Blend until smooth and then chill in the refrigerator for a few hours before freezing in your ice cream machine. Makes 1 quart. The Cuisinart only takes 20-25 minutes to freeze the ice cream. Then you transfer it to a freezer container and freeze for a firmer consistency. Within a few hours we were enjoying creamy, sweet roasted banana ice cream! It was absolutely delicious, with a robust flavor unlike any other ice cream I've ever eaten!